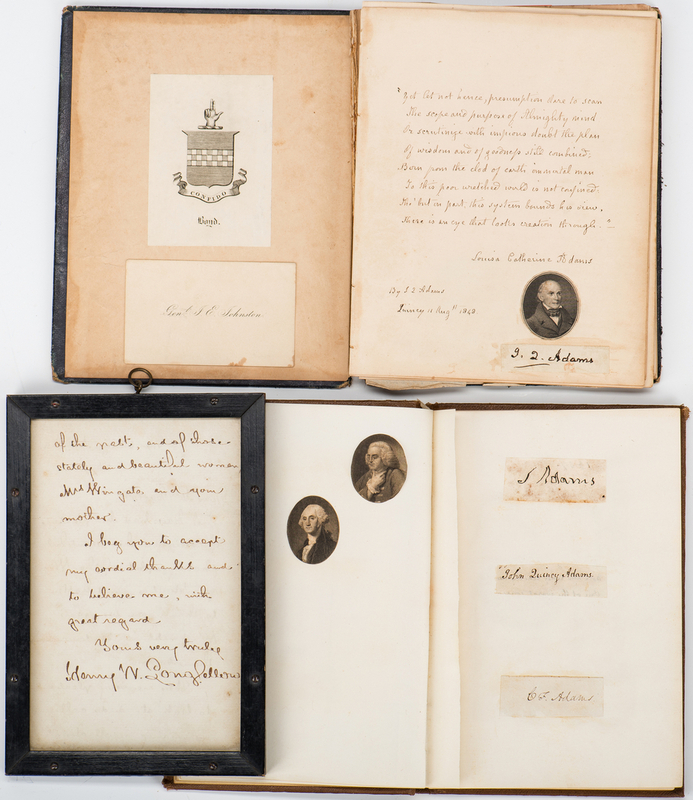 Two (2) autograph albums from the early Nineteenth Century to the Civil War, containing the signatures of Presidents and First Ladies, prominent Civil War figures, notable authors, and other important Americans. 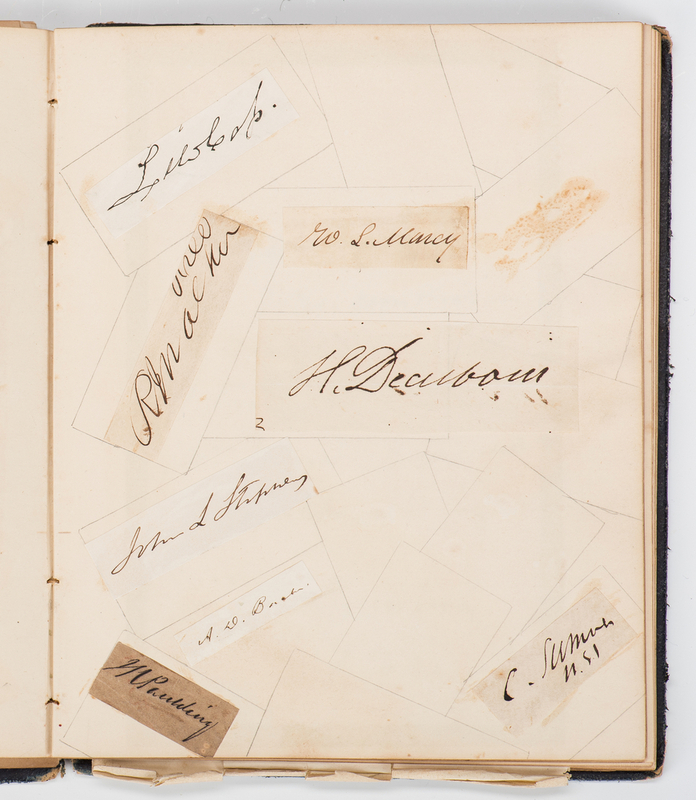 Approximately fifty-six (56) autographs are inscribed directly onto the pages, pasted to paper, or on loose paper, with a few images, drawn onto the paper and loose. 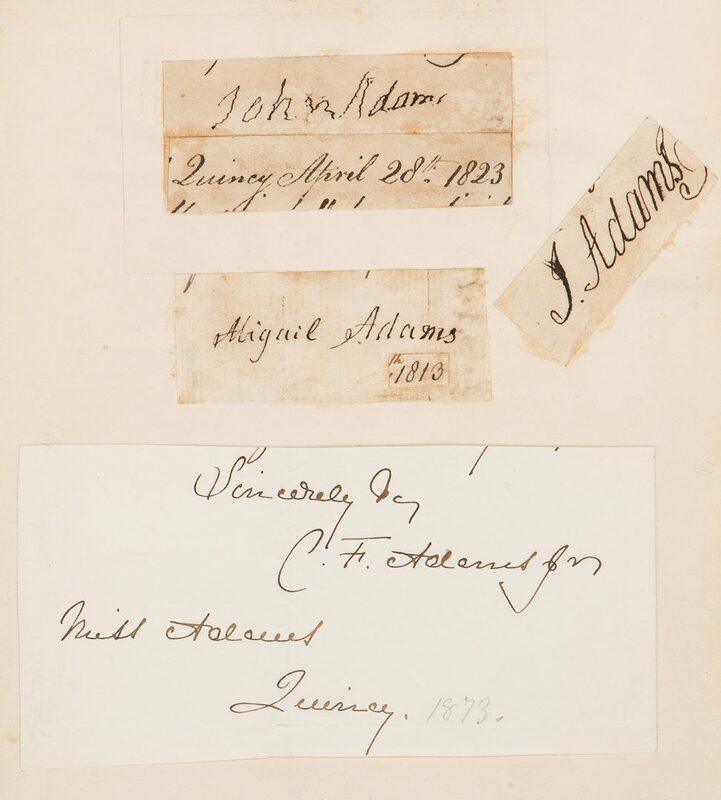 Presidents and First Ladies: Two (2) JOHN ADAMS (1735-1826) clipped signatures pasted to page with Abigail Adams and Charles Francis Adams Sr. signatures (see below). 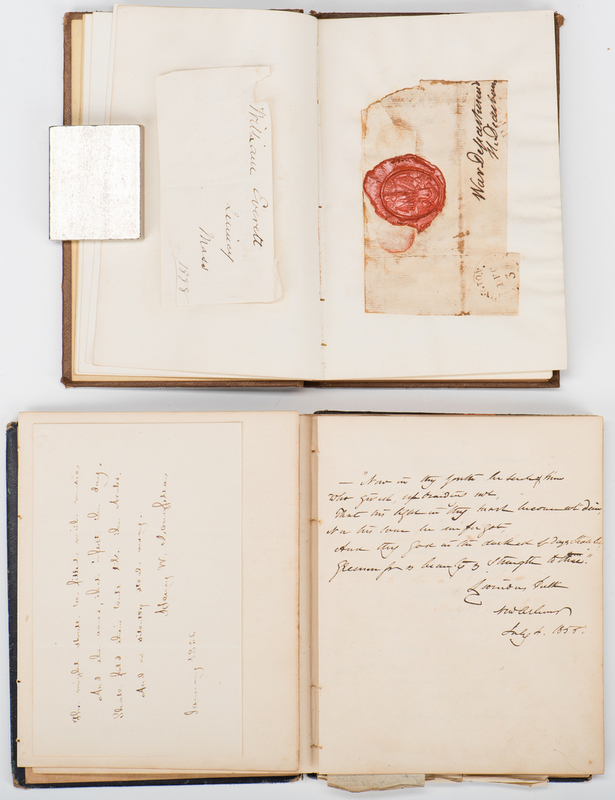 Includes one (1) end of life signature with additional piece of paper with location and date reading "Quincy April 28th 1823" pasted below signature, located in blue album. 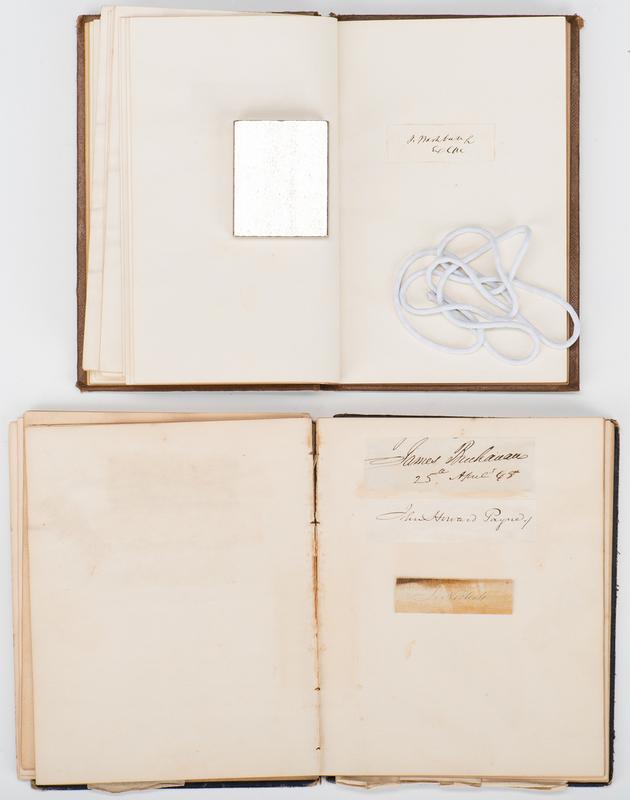 One (1) ABIGAIL ADAMS (1744-1818), wife of John Adams, clipped signature pasted to page with John Adams and Charles Francis Adams Sr. signatures (see above), with additional piece of paper dated "1813" pasted below signature, located in blue album. Two (2) JOHN QUINCY ADAMS (1767-1848) clipped signatures. One (1) pasted to lower right corner of page with Louisa Catherine Adams autographed poem (see below), located in blue album. 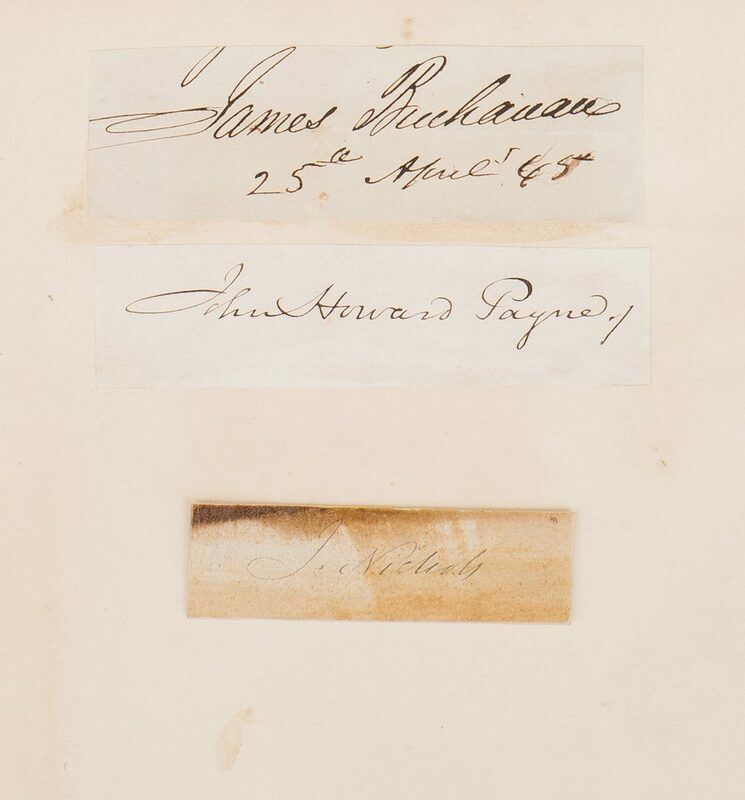 One (1) pasted to page with Samuel Adams and Charles Francis Adams Sr. signatures (see above), located in brown album. One (1) LOUISA CATHERINE ADAMS (1775-1852), wife of John Quincy Adams, one-page autographed poem written on the page, dated August 11, 1848 from Quincy, MA, reading "Yet let not hence, presumption dare to scan The scope and purposes of Almighty mind Or scrutinize with impious doubt the plan Of wisdom and of goodness still combinedÖ". 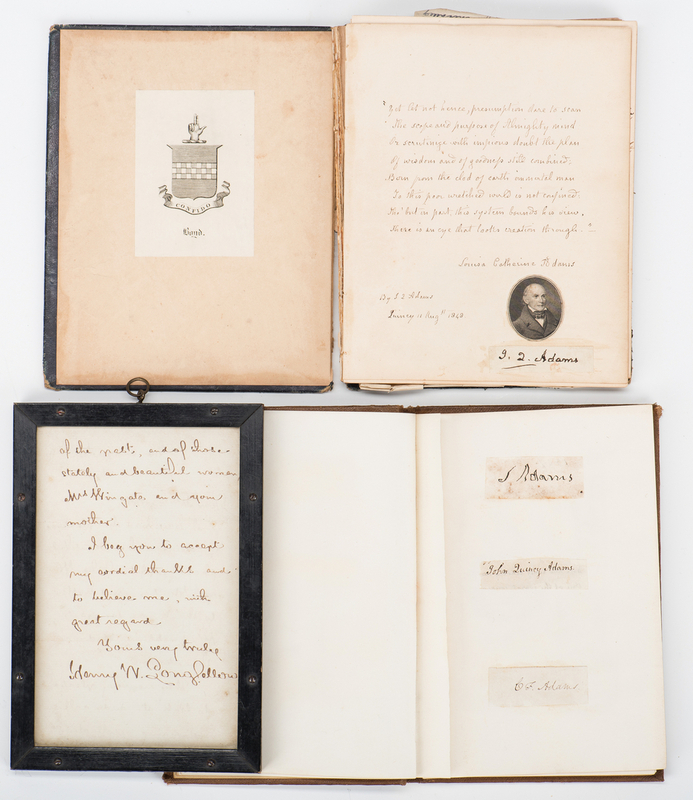 Includes a small engraved portrait of John Quincy Adams with his clipped signature pasted to the page (see above) with a notation in Louisaís hand indicating that the poem was written by John Quincy Adams, located in blue album. 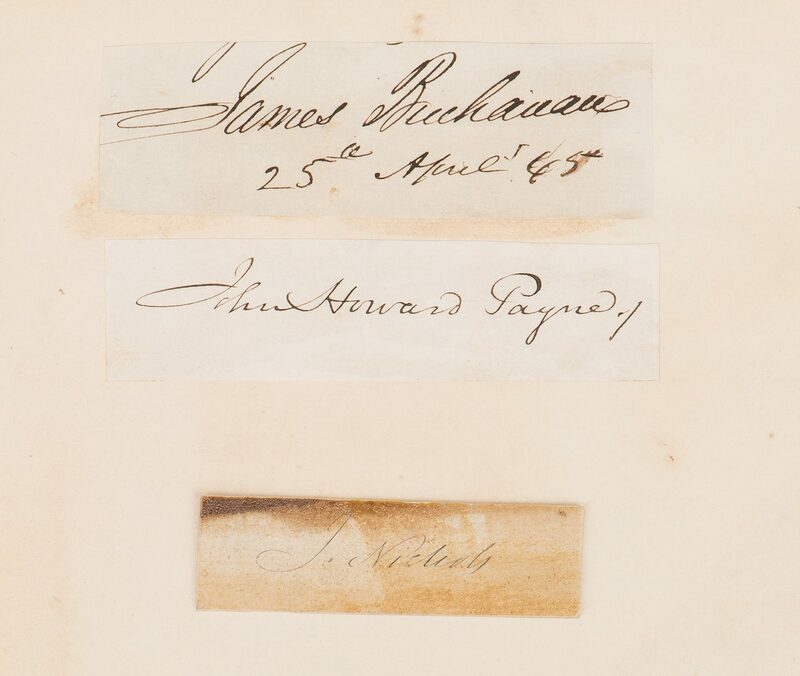 One (1) JAMES BUCHANAN (1791-1868) clipped signature pasted to page, dated April 25, 1845, located in blue album. One (1) JAMES MADISON (1751-1836) free franked panel pasted to page, dated February 19 [year unspecified], from Washington, D.C., addressed to Richard Cutts, his brother-in-law, located in blue album. One (1) DOROTHEA DANDRIDGE PAYNE TODD MADISON (1768-1849), also known as DOLLEY MADISON, wife of James Madison, one-page autographed quotation written on page, dated June 1, 1848 from Washington, D.C., reading "Temper, thy power more magical Than that which graced of old Amphion's lyre, Can savage hearts with wondrous spell the mind enthrall Can clean suspicion's mist with gladdening fire…", located in blue album. One (1) JAMES K. POLK (1795-1849) clipped signature pasted to page, undated, located in blue album. 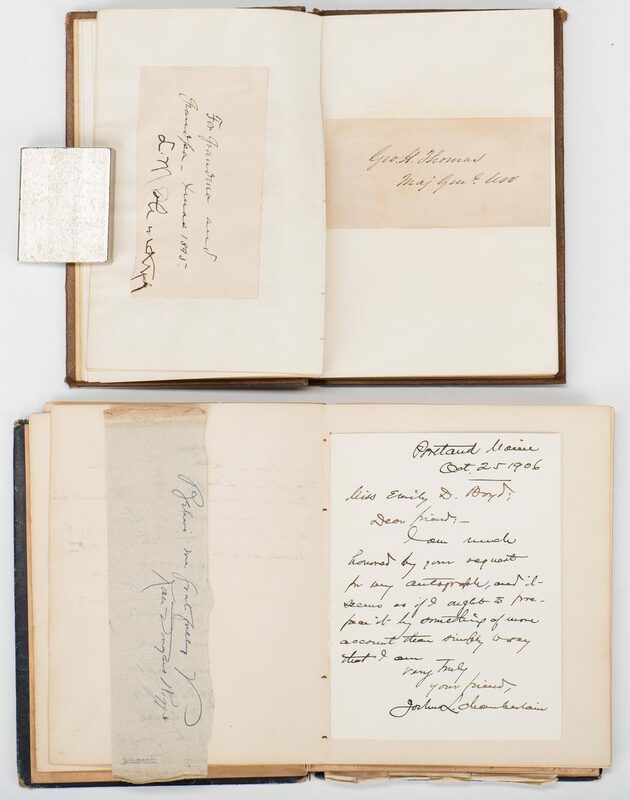 Authors: One (1) WASHINGTON IRVING (1783-1859) signature written on page, dated May 19, 1852 with notation indicating that it was "written at Rockwood", above clipping engraving of Rockwood pasted to page below, located in blue album. 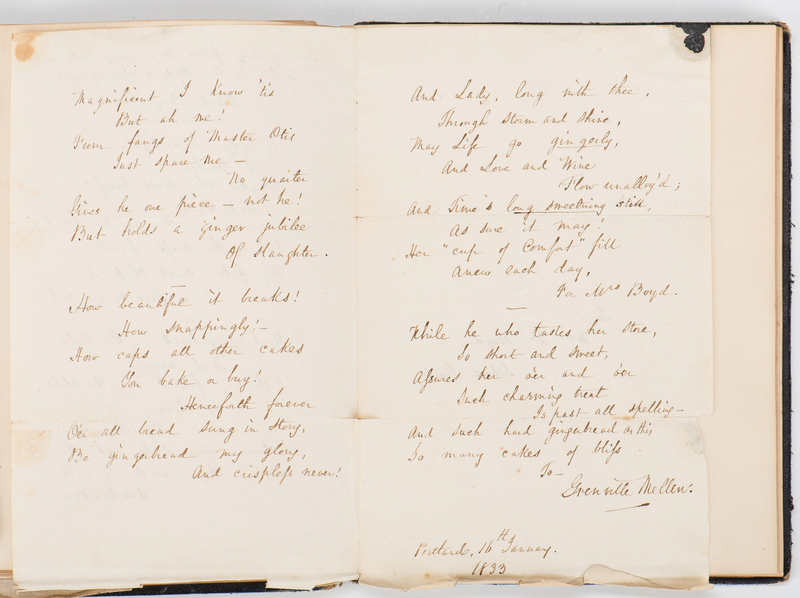 One (1) HENRY WADSWORTH LONGFELLOW (1807-1882) one-page autographed quotation written on separate paper, the top margin pasted to page, dated January 1856, containing the concluding stanza of his poem "The Day Is Done", located in blue album. 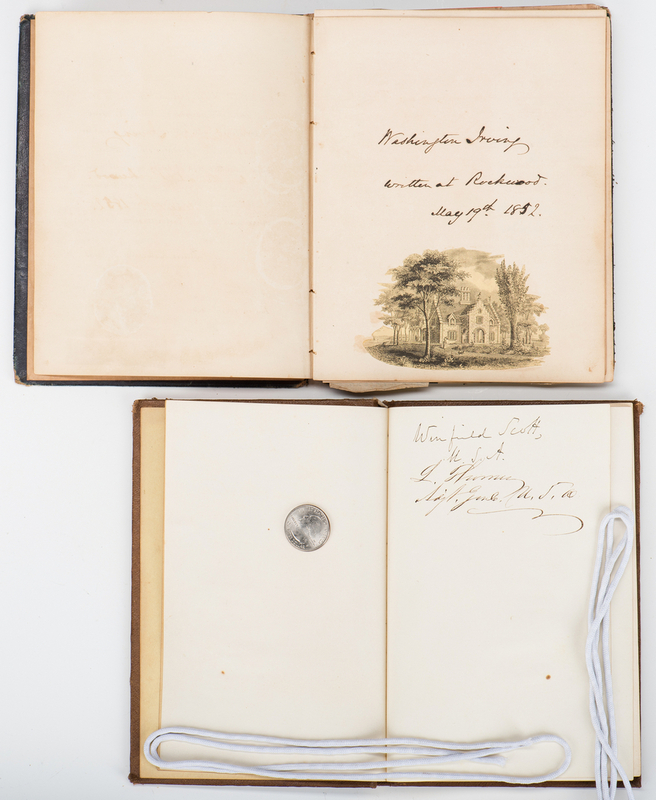 One (1) JOHN HOWARD PAYNE (1791-1852), author of "Home, Sweet Home", clipped signature pasted to page, undated, located in blue album. 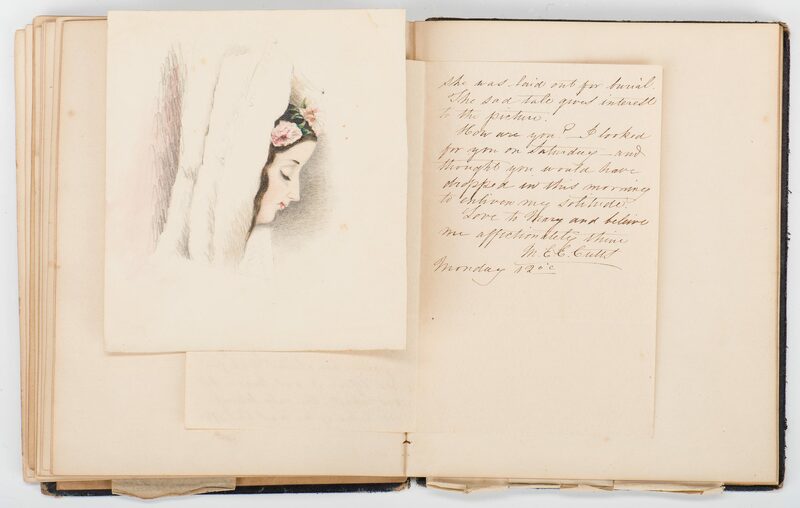 One (1) LYDIA HUNTLEY SIGOURNEY (1791-1865), an American poetess commonly known as the "Sweet Singer of Hartford", one-page, double-sided autographed letter written on separate paper, the left margin pasted to page, dated December 31, 1844 from Hartford, CT, sending New Yearís wishes, located in blue album. Civil War Generals/Leaders: One (1) WILLIAM TECUMSEH SHERMAN, a leading Union general, clipped signature from the bottom of a letter pasted to page, dated February 28, circa 1860's from Hilton Head, SC, located in brown album. One (1) JOSHUA LAWRENCE CHAMBERLAIN (1828-1914), a Union general remember for his heroic actions at Little Round Top at Gettysburg, one-page bifolium letter, left margin pasted to page, dated October 25, 1906 from Portland, ME, in which he responds to Emily D. Boyd's request for his autograph, located in blue album. 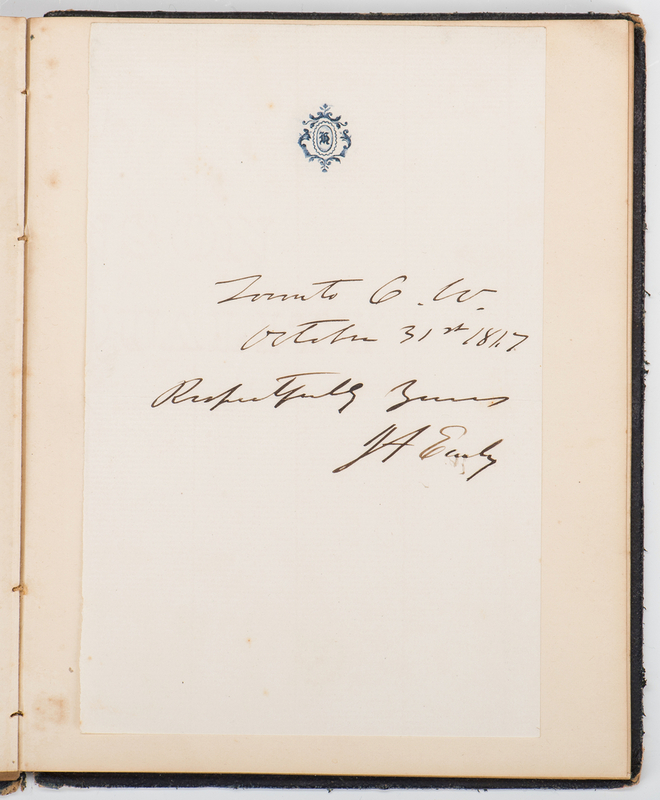 One (1) JUBAL ANDERSON EARLY (1816-1894), a Confederate general, one-page autograph written on separate paper, the top margin pasted to page, dated October 31, 1847, from Toronto, ON, Canada, located in blue album. 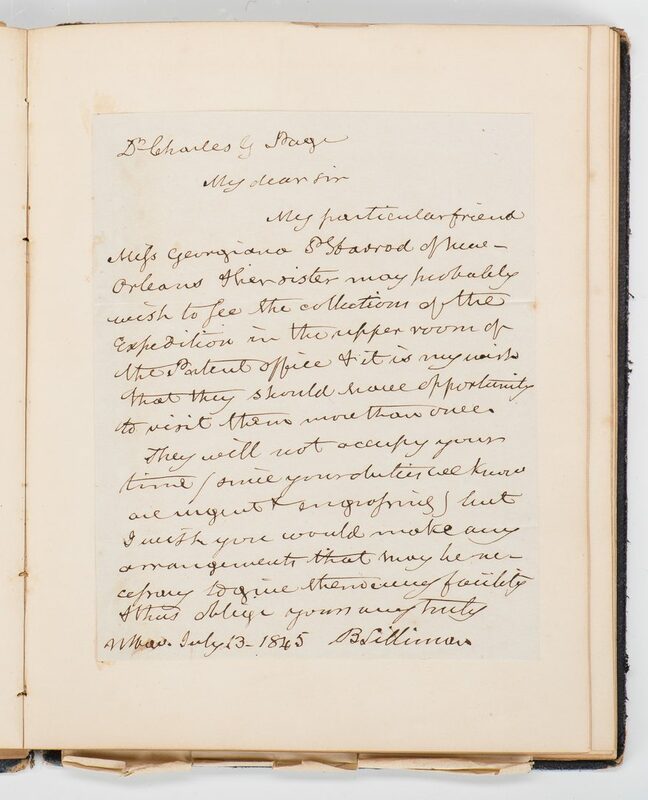 One (1) GEORGE MCCLELLAN, Union general, clipped signature from the bottom of a "Head Quarters, Army of the Potomac" letter pasted to page with George H. Thomas signature (see below), located in brown album. 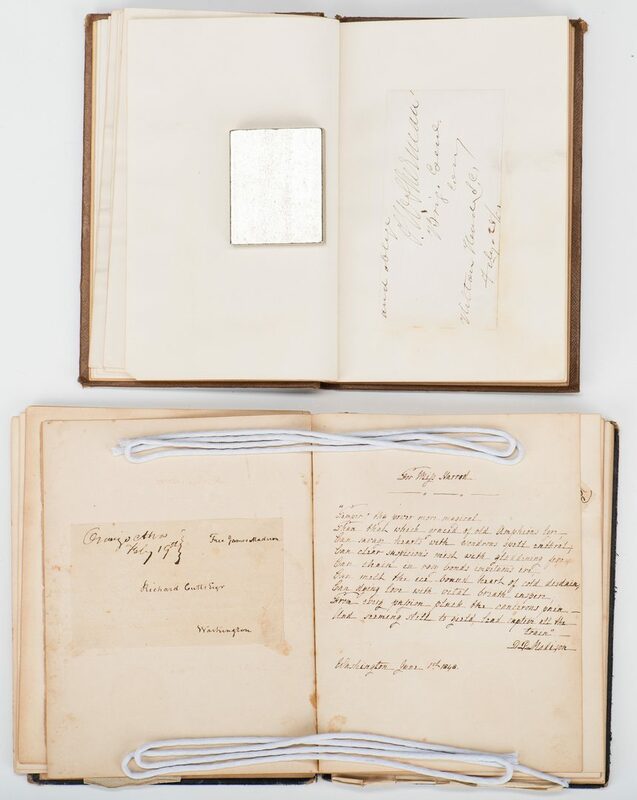 One (1) LEONIDAS POLK (1806-1864), a Confederate general killed in action near Atlanta in 1864, autographed quotation written on the page, dated July 4, 1855 from New Orleans, LA, reading "Now in thy youth he served him who givest…That his light in thy heart…", located on blue album. Two (2) GEORGE H. THOMAS (1816-1870), a Union general nicknamed "The Rock of Chickamauga". 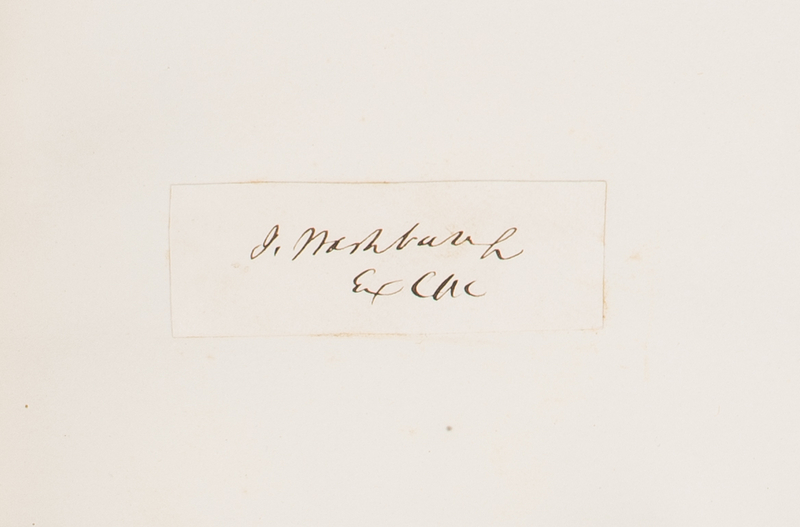 One (1) clipped signature pasted to page, undated, located in brown album. 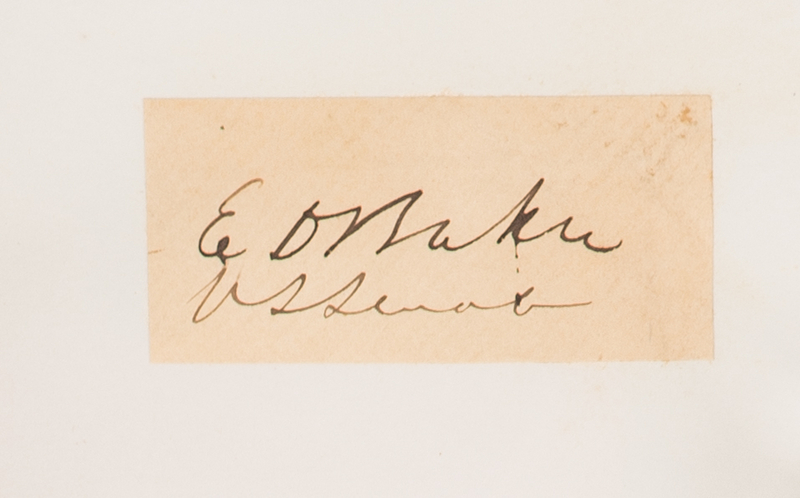 One (1) clipped signature from the bottom of a "Head Quarters, Army of the Potomac" letter pasted to page with McClellan signature (see above), located in brown album. 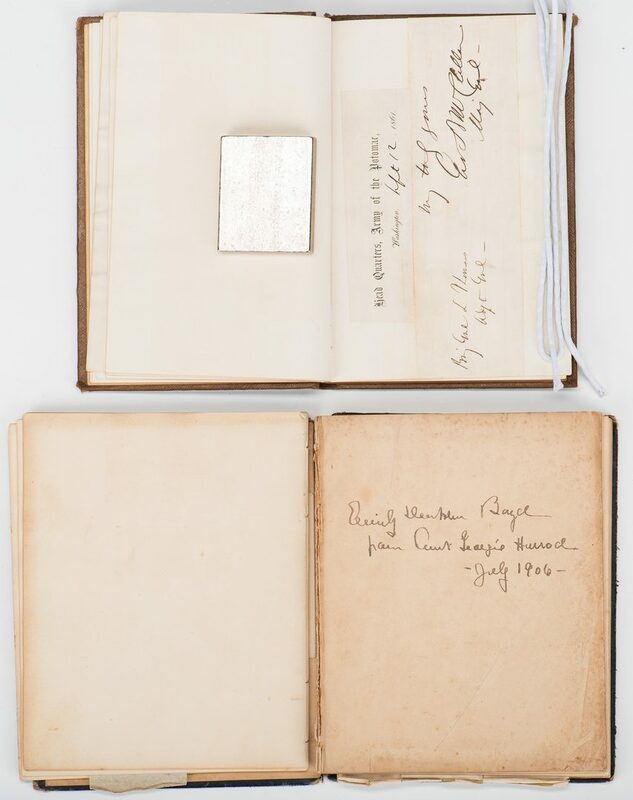 One (1) JEFFERSON DAVIS (1808-1889), an American politician who served as the only President of the Confederate States, clipped signature pasted to the page, dated February 25, 1867, reading "very truly your friend Jefferson Davis", located in blue album. Others Notable Figures: Two (2) HENRY DEARBORN (1751-1829), a Revolutionary War general, Congressman and Jefferson's Secretary of War, and Commanding General of the United States Army during the War of 1812 clipped signatures. One (1) clipped signature pasted to page, undated, located in blue album. One (1) franked panel pasted to page, dated December 3 [year unspecified], from the War Department, Washington, D.C. Includes red wax seal, located in brown album. One (1) SAMUEL ADAMS, an American statesman, political philosopher, and one of the Founding Fathers of the United States who signed the Declaration of Independence, elderly clipped signature pasted to page with John Quincy Adams and Charles Francis Adams Sr. signatures (see above), located in brown album. 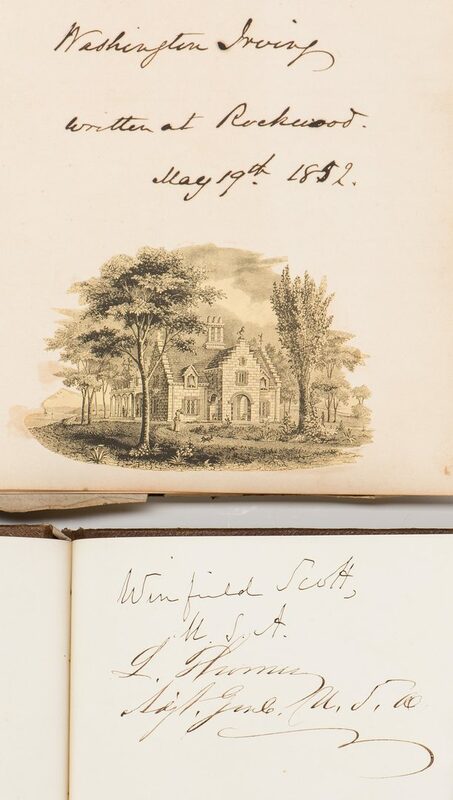 One (1) WINFIELD SCOTT (1786-1866), a United States Army general and the unsuccessful presidential candidate of the Whig Party in 1852, signature written on the page, located in brown album. 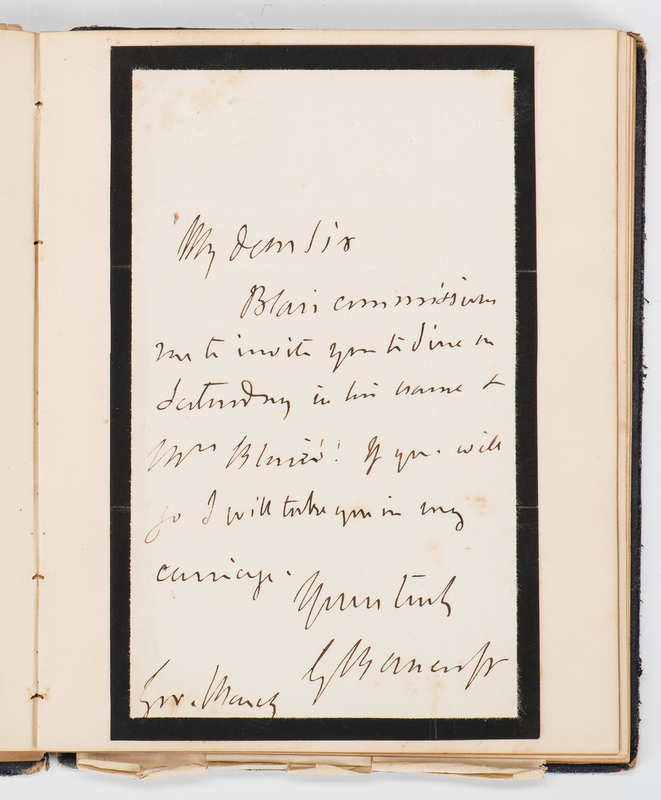 One (1) GEORGE BANCROFT (1800-1891), an American historian and statesman, one-page autographed letter written on black bordered paper, left margin pasted to page, undated. 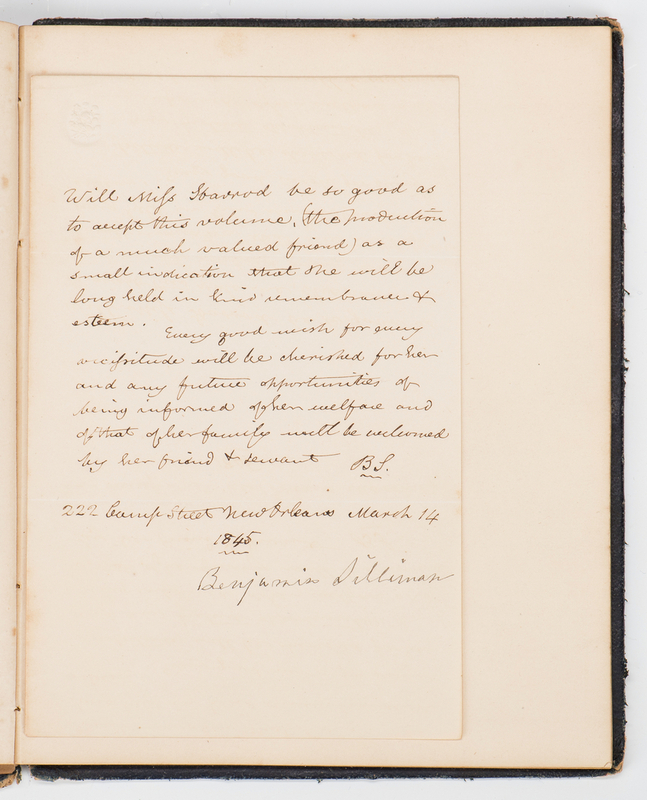 One (1) BENJAMIN SILLIMAN, a prominent American scientist, one-page bifolium letter loose from album, dated March 14, 1845, New Orleans, LA, written to Miss Harrod as an introduction, located in blue album. Also includes clipped signatures of CHARLES FRANCIS ADAMS SR. (1807-1886), LEWIS CASS (1782-1866), WILLIAM MARCY (1786-1857), JOHN PAULDING (1758-1818), CHARLES SUMNER (1811-1874), and others. 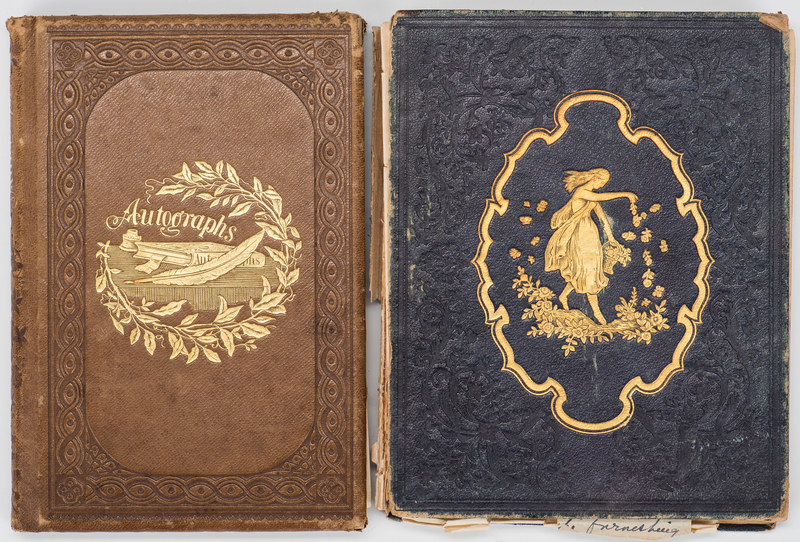 Autographs housed in one (1) hardbound tooled navy-blue leather with gilt pictorial covers, containing approximately forty-three (43) autographs, with Boyd family crest ex libris label pasted to inside of front cover, gilt edged paper, and one (1) hardbound tooled light brown leather album with gilt pictorial front cover with gilt lettering to front cover and spine, containing approximately thirteen (13) autographs, inscribed "Annette M. Boyd from her Sister" in ink, front end paper, gilt edged paper (see above description for locations of specific autographs). 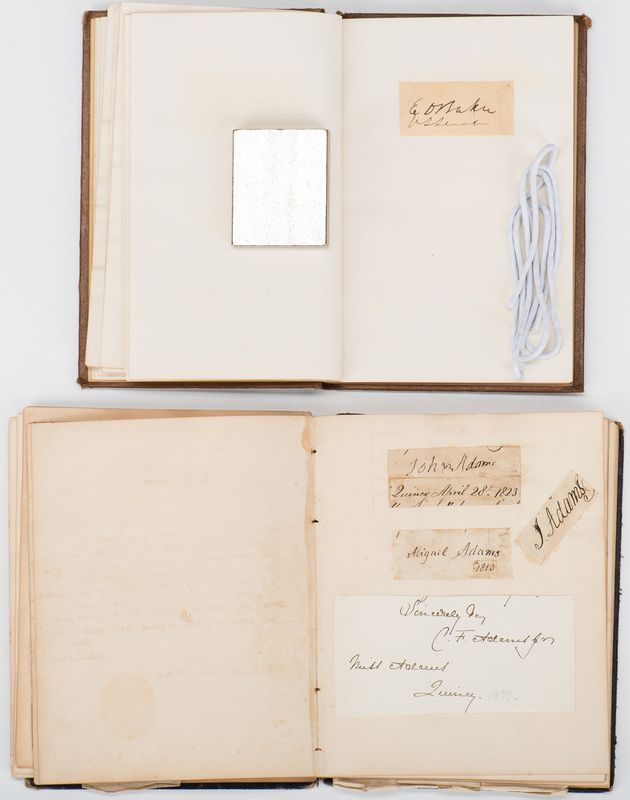 3rd item: HENRY WADSWORTH LONGFELLOW ALS. One double-sided, handwritten letter from Henry W. Longfellow, Cambridge, MA, to Mrs. Carroll, dated April 9, 1877. He writes to thank Mrs. Carroll for sending him photographs of the Wingate House. Housed under double-sided glass in a painted wooden frame with hook, top center. Sight – 6 3/4" H x 4 3/8" W. Framed – 7 3/4" H x 5 3/8" W. Provenance: The Estate of Charles Boyd Coleman, Jr., Chattanooga, TN. The books and letter descended in the family of Lewis M. Coleman Jr. II (1894-1914), son of Lewis M. Coleman Jr., son of CSA Lt. Colonel Lewis Minor Coleman (1827-1863) and Mary Ambler Marshall, daughter of James K. Marshall and granddaughter of United States Chief Justice John Marshall (1755-1835). 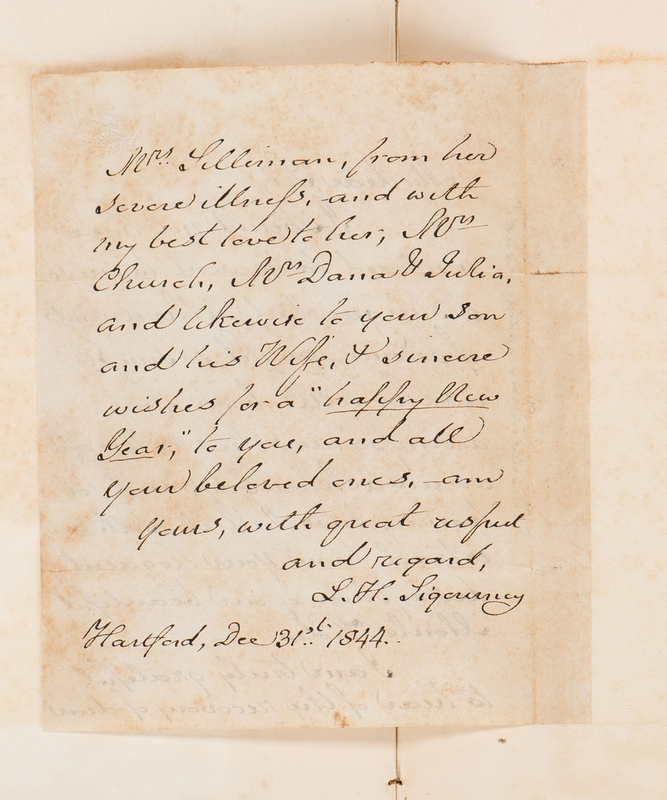 Lewis M. Coleman Jr. also was related to the family of Revolutionary War General Henry Dearborn by his marriage to Julia Wingate Boyd, daughter of Annette Maria Dearborn Boyd, who was the daughter of Greenleaf Dearborn (1786-1846) and great granddaughter of Henry Dearborn (1751-1829) on her mother's side. 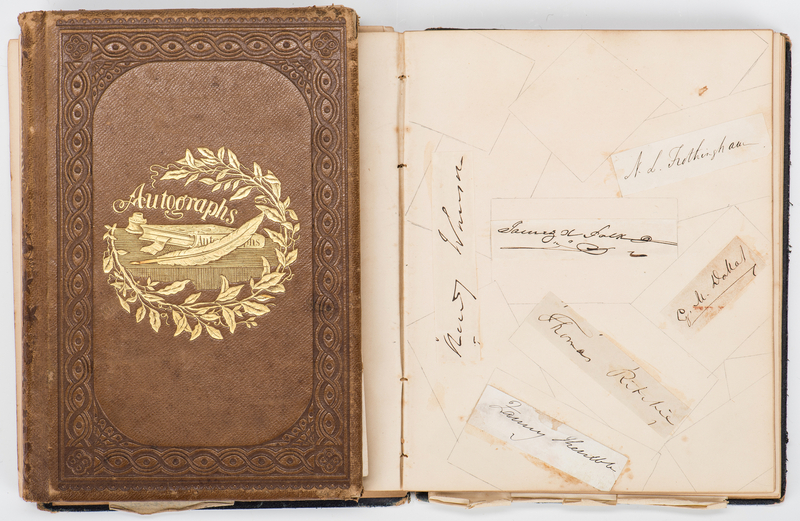 CONDITION: Autograph albums: Signatures in overall good condition with some foxing spots, old paste stains, toning impressions, minute tears (do not affect signatures). Covers in worn condition, majority of spine is no longer present, blue album. First leaf of pages separated from binding, blue album. 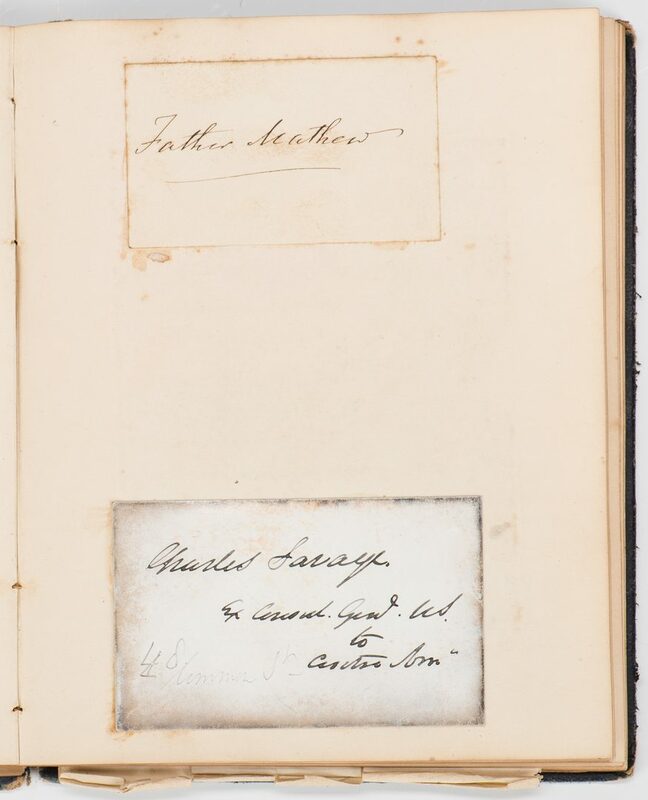 Many of the pages are almost separated from binding, including page with John Adams and John Quincy Adams cut signatures, brown album. Several of the pages are blank, both albums. 3rd item: Overall good condition with foxing spots.